This is an article about using healthcare words that are easy to understand. It is written at an eighth-grade level. Most people in the U.S. read at or below an eighth-grade level. That means they can understand Steven King novels but not The New York Times. More than 30 million U.S. adults cannot read above a third-grade level, according to ProLiteracy. Healthcare literacy rates are worse. Only 12 percent of U.S. adults have proficient health literacy, according to the U.S. Department of Health and Human Services (HHS). That is because healthcare terms are hard to understand for nearly everyone, despite reading level. Adults with low health literacy rates are more likely to use costly emergency room services, suffer from heart failure and forego preventive services, according to ProLiteracy. Each has an impact on a health system’s financial bottom line. In healthcare, the words are big and weird looking. Those words are great for doctors and nurses who have special education and training. They are not great words for communicating with patients and consumers. Still, we continue to see complex words show up in everything from prescription information to blog posts. This article is not meant to help doctors better communicate with their patients. It is meant for marketers and public relations pros. It is meant to stress the importance of using clear language and to provide some healthcare communications tips and tricks you can use to improve the clarity of your content. Clear communication is critical in healthcare. Yet, many marketers often default to doctor language. That is a big problem. When marketers don’t understand something, they choose to use the jargon rather than try to define it clearly. Doctors and nurses have final approval and don’t like basic language if it doesn’t perfectly explain the jargon. Plus, big words sound smart. Writers get lost in an anecdote or turn of phrase, losing sight of the key message. Relying on our “gut” to determine if something is easy to read. Of course, it’s somewhat more complex than just those five points but, hey, let’s keep it simple. I’ve always been able to bring healthcare communication challenges back to one of these four points. Easy-to-understand language is important beyond when doctors talk to patients. Yes, that is important – and all content, including every pamphlet, should be reviewed critically, looking for complex terms and phrases. Let’s focus on communications outside of the exam room. We have a world-class oncology department with dozens of specialists. We have the best cancer treatments and doctors who treat every kind of cancer. Which one is the easiest to understand? A doctor would likely say No. 1. So would many marketers. It has fewer words and looks professional. But of course, No. 2 is the better option. We can’t expect patients to access a new service, realize they need flu shots or get mammograms (checked for breast cancer) if we use complex language. Not only is that a public health concern, it means your marketing and communications isn’t bringing in patients and increasing revenue. That couldn’t be truer when it comes to writing healthcare content for consumers. Luckily, a number of tips and tricks can help anyone simplify and clarify healthcare communications. Here are several healthcare communications tips and tools focused on improving copy. Keep in mind, it’s not just health-specific terms that increase reading difficulty. As this document shows, words like “utilize” and “feasible” also are included. 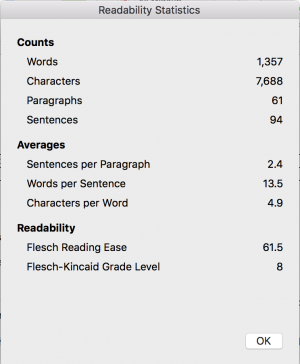 A number of scoring methods, including the Flesch-Kincaid Readability Test, can let you know if your copy reads at an eighth-grade reading level. If you use the Yoast SEO tool on your blog or website, the Flesch-Kincaid test is available for each post you write. Readable.io is a great tool. It combines several scoring systems and highlights longer sentences, adverb use and big words throughout your copy. Unfortunately, the free version only lets you score a couple pieces of content before requesting you sign up for the premium version. Lastly, use Word’s readability statistics. It’s useful and free. These instructions show you how to turn on the statistics. Often, it takes an extra word or two to clarify a medical term. That’s OK. Yes, always be efficient with your words but don’t sacrifice clarity. This is the least scientific method. But, it is perhaps my favorite and most reliable test. Have your kids read it and explain what they read. Did they pause? Did they stumble on any words? If so, rewrite. If you don’t have kids, ask coworkers to share the content with their kids. I guarantee your writing will improve. At LSB, we love testing messages on social platforms. A great way to test on social media is to use dark Facebook posts. This article will show you how to optimize your dark posts. Social tests have two benefits regarding messaging. You get to see how people are responding to simple language vs. healthcare jargon. And it gives you quantitative evidence to make a case for simple language. Warning: This will not always work to convince doctors that you are right because ALL research can be questioned. However, it will help prove your point and increase your odds of winning a battle over wording. Lucky for us, a lot of research about health literacy exists. A lot of the research shows that people don’t understand basic health terms and it can affect their overall health. When someone can’t understand healthcare language, there is a good chance they don’t use medicines correctly or get the care they need for certain symptoms. This article in The Permanente Journal discusses the impact poor health literacy rates can have on patient safety. HHS has good material, too. “America’s Health Literacy: Why We Need Accessible Health Information”, is a good place to start. This in-depth look at health literacy from Harvard is more than you’ll ever need. But, the first chapter can help make your case. Ultimately, clear language will result in better-informed patients who better understand what your healthcare system does and how they benefit from it. From a public health standpoint, this is significant. From a competitive standpoint, it’s critical. Whoever communicates best is going to win new patients and influence current patients to seek care they need. Of course, writing simple healthcare messages isn’t easy. Heck, I missed a deadline trying to get this article down to an eighth-grade level. But now it’s reading at a 7.7 grade level – perfectly acceptable for all your healthcare communications.